Stadiums, arenas, and sports venues are some of the most challenging jobs to bid due to their sheer size and complexity. Many cleaning businesses lose money on these types of jobs because of underbidding, which is easy to do unless you take every last detail into account. Here are a few things to keep in mind while putting together your bid. 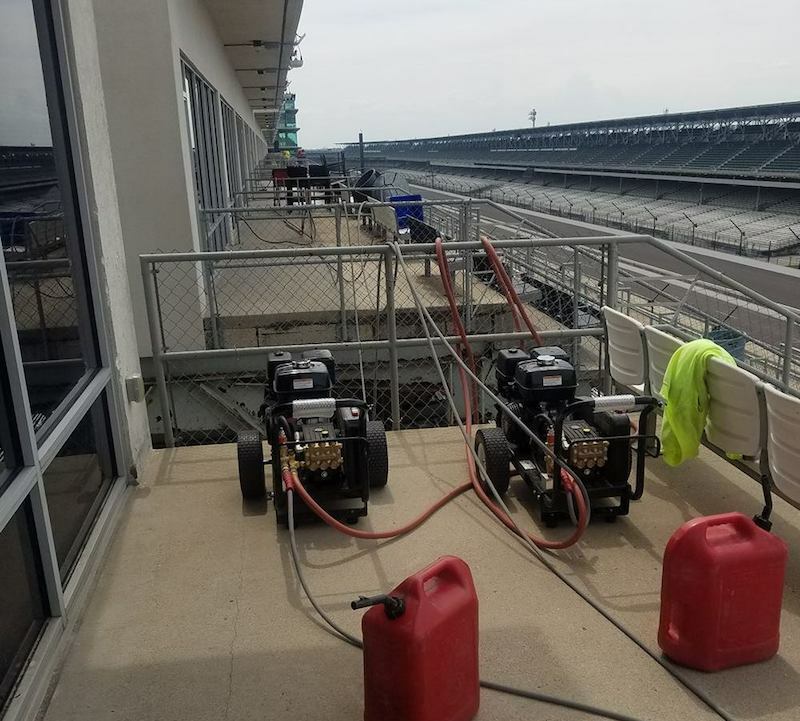 The sheer size of a venue may be intimidating for many pressure washing businesses, but the most important aspect of bidding out a cleaning job is to ensure you have the right equipment. Making sure you’re able to reach every surface that needs cleaning will determine the amount of time and energy you’ll need to dedicate to the project. Do you need a special lift or scaffolding to reach the underside of stadium seating? 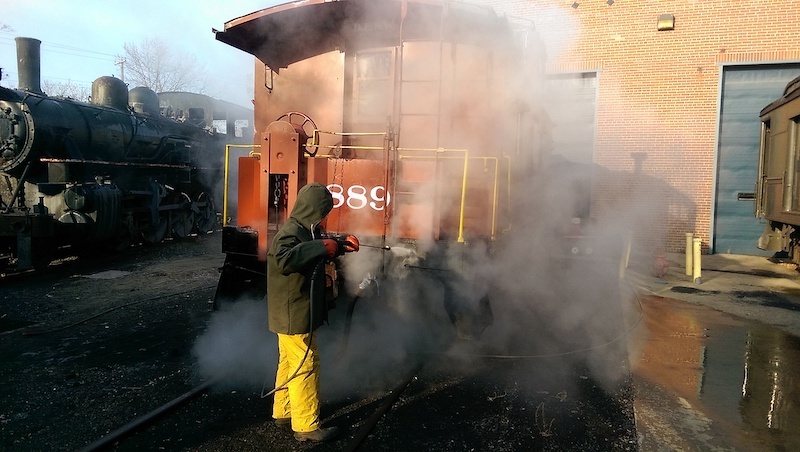 Not having the proper equipment could greatly hinder your ability to do the job thoroughly and efficiently. Plan ahead and know if there are any areas that require prep-work prior to cleaning. 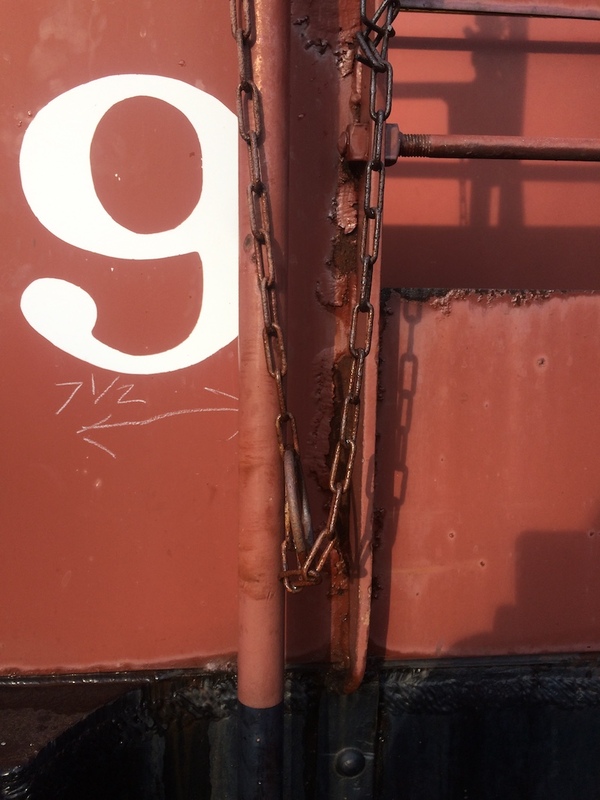 Is there debris or other venue belongings that could obstruct your people or equipment? Be sure to know the area well enough to foresee any obstacles you may run into. If there are multiple areas to be cleaned within the same venue, it is generally wise to divide and conquer. By dividing a venue into zones, you’re taking the first step in prioritizing your jobs tasks. There may be zones you place a higher priority on because they’re literally higher in elevation, and the flow of soiled water determines that they be cleaned in a descending order. 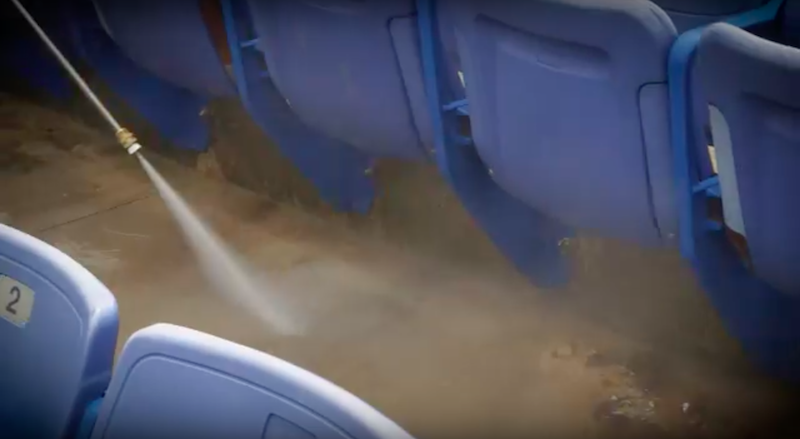 There may be other times where the venue’s operations depend on you cleaning specified zones first, then moving on to zones that don’t inhibit their preparations such as a concession stand. You may not realize it but accounting for this prioritization means taking into consideration the movement of people and equipment which could take extra time. Cleaning after an event can be much more time consuming when there was high attendance. Even if you’re not responsible for trash removal, there may still be a significant quantity of spills, stains, and crumbs to wash away. Knowing the approximate attendance of an event will allow you to adjust your bid because smaller crowds generally require less cleanup and vice versa. Consider any potential limitations you may have as it relates to chemicals or equipment. Regardless the reason for the limitation you’ll need to know if you’re able to offer an alternative solution and if it will add any time to your bid. There are other factors that can be taken into consideration when bidding a stadium, but the items outlined above are often overlooked by even the best businesses. Always remember, under promise and over deliver! 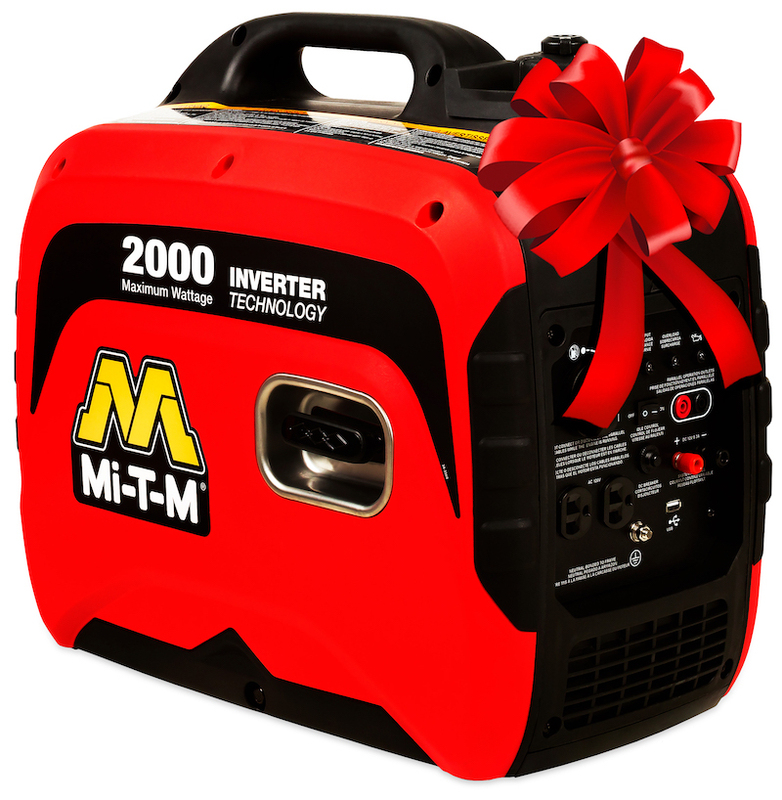 Mi-T-M Dealers are experts when it comes to equipment & applications. Reach out to the Mi-T-M dealer nearest you for any additional advice you may need when bidding out such a large project. 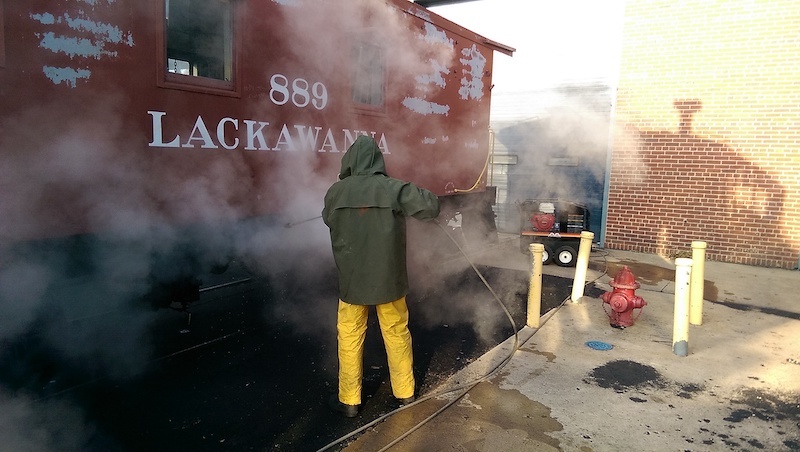 Get Excited About Pressure Washing! Go ahead. Try it. 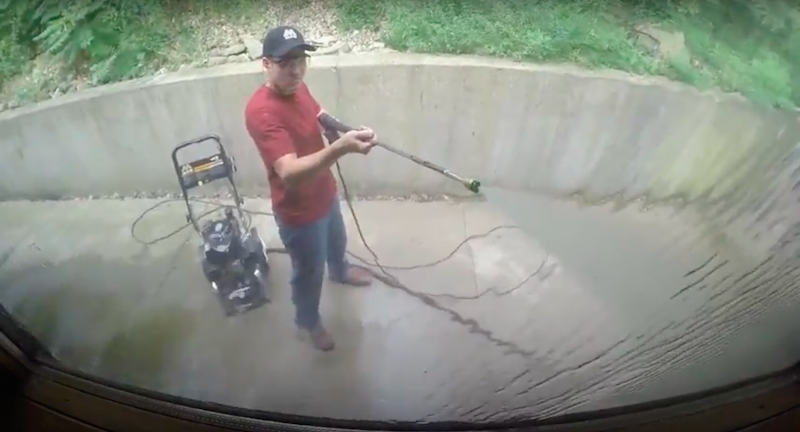 It’s impossible not to be happy while using a pressure washer. You hold in your two hands a wand that’s capable of delivering great power and amazing cleaning ability. You can sign your name in the dirt, grime, moss, and mold. You see the progress you’re making and it’s exciting. 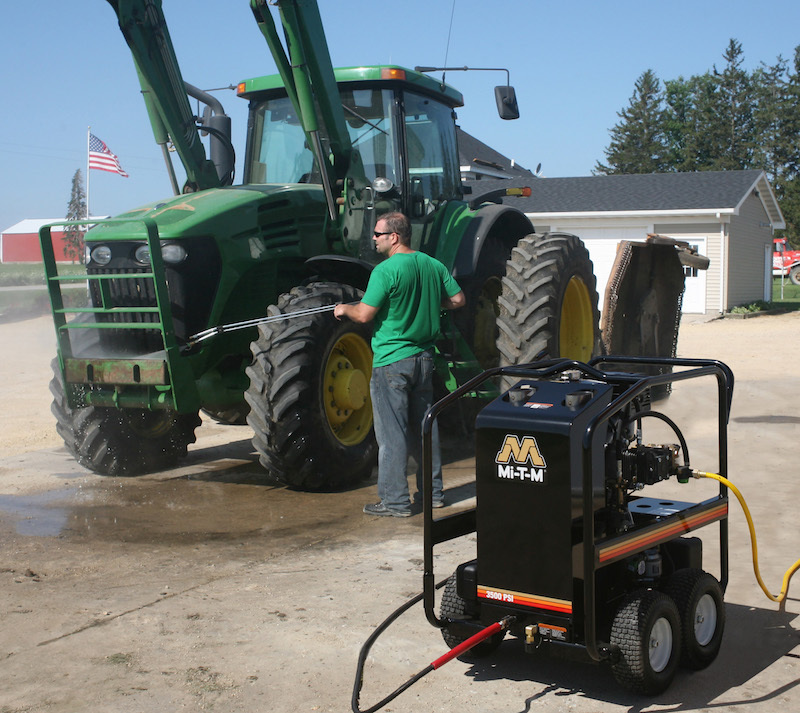 Mi-T-M manufactures every type of equipment you need—from our top rated commercial pressure washer to the best pressure washer for home use—and you’ll appreciate that our hot and cold pressure washers make short work of any dirty surface. 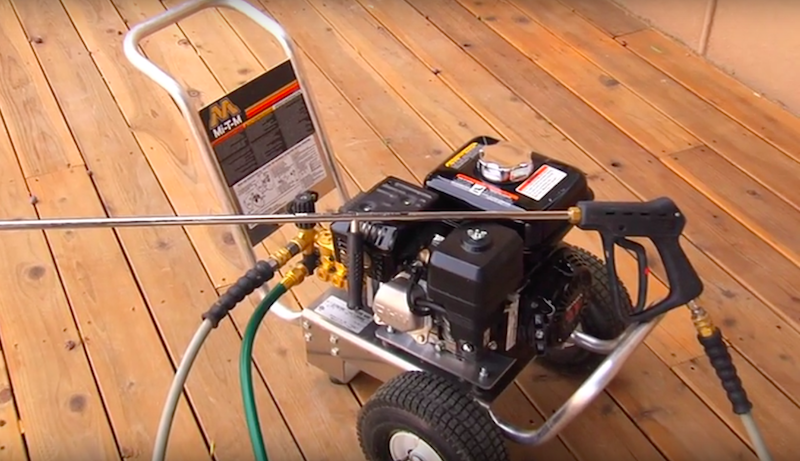 Power washing your house is a snap, especially when you use a Mi-T-M telescoping pressure washer wand. Anything is possible. 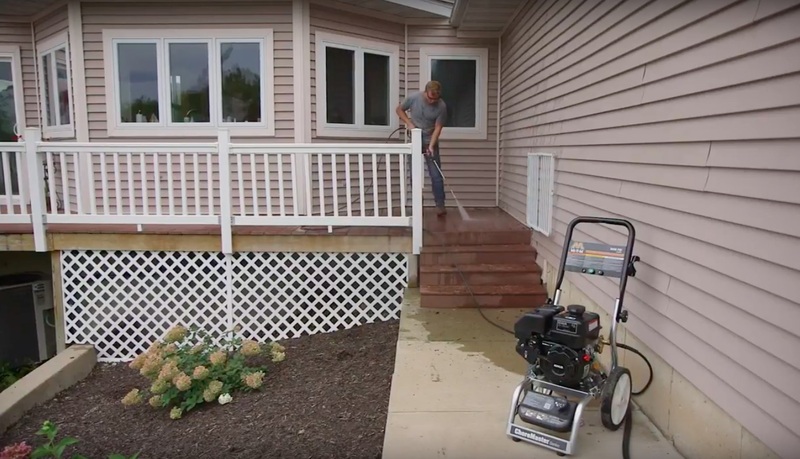 Power wash your deck. Pressure wash gutters, siding, driveways, cars, boats, toys, playground equipment, bikes, fences, dog kennels, sheds, and the list goes on and on. Once you’ve cleaned one surface, you’ll be hooked. As great as it is to use a power washer, when you add accessories, you really boost the excitement factor. 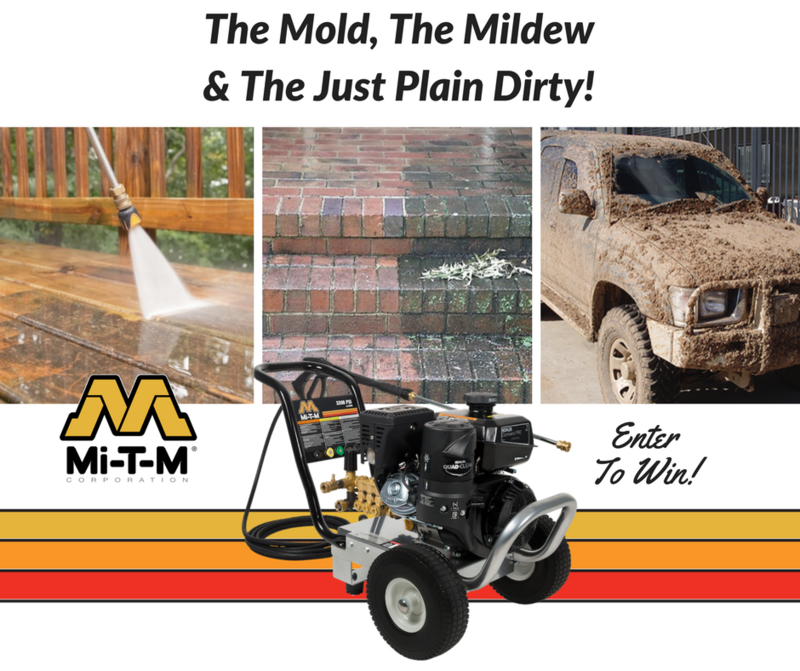 Fortunately, Mi-T-M has dozens of pressure washer accessories to fit your every need. Easy to install and use, our accessories help you customize your cleaning solutions. 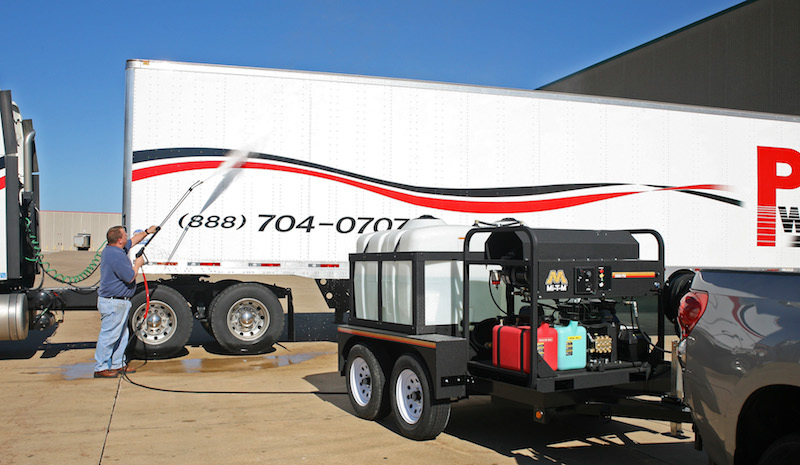 Our authorized dealers will help you select the best pressure washer for your house or business. Then we’ll discuss which accessories make the most sense for your cleaning goals. Following are a dozen Mi-T-M accessories guaranteed to delight you. These are just the tip of the iceberg. We sell accessories for every use you can possibly imagine. Just as your shower nozzles direct the spray where you need it, so do our wide variety of pressure washer nozzles. Choose from our quick connect, long-range (30-feet) chemical, detergent, multi-function, and/or rotating nozzles. Designed to boost your cleaning power and reduce your cleaning time, the right nozzle is critical for your job specifications. Our trained distributors will listen to your needs and, pardon the pun, hook you up with exactly the right nozzle. You want total and absolute control at your fingertips? Mi-T-M can give it to you. Our multi-function nozzle provides six settings for all your cleaning needs. That’s one setting for every day of the week, but Sunday. Made from durable stainless steel, with this nozzle you can choose degrees of 0, 15, 25, 40. The other two nozzle settings are for soaping and rinsing. If you love the multi-function nozzle above, you’re sure to appreciate our Mi-T-M rotating nozzle. Attach this marvelous device to your pressure washer wand, set your timer, and start saving time. This wonderful nozzle boosts your cleaning power with zero spray impact 25-degree coverage. We offer four models of this nozzle, so you’re guaranteed to find one for every application of your Mi-T-M equipment. Sure, you can see it, but you just can’t get to it. Even with the tallest ladder on the market and the right nozzle head, sometimes you can’t reach what you’re trying to clean. Mi-T-M will help you get close to the action with our durable extension wands. Our lightweight, aluminum models range in length from 6’ 5” to either 18 or 24’. Imagine that you’re pressure washing siding and there’s mold at the top corner you can’t blast away. Now you can. Simply attach one of our extension wands and attack grime. Bye bye mold. Hard-to-reach areas and nooks and crannies are no match for our clever little pivot coupler. With three different cleaning angles, this Mi-T-M accessory connects between your pressure washer wand and high pressure nozzle. 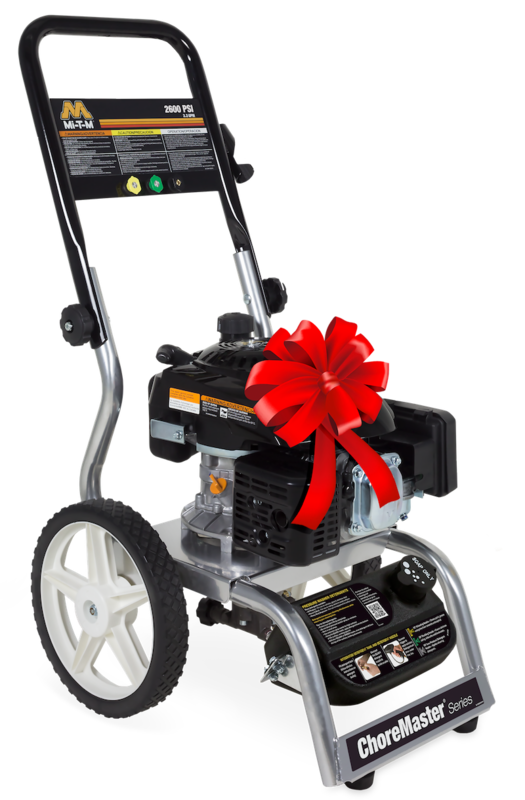 It’s ideal for nearly every cold water pressure washer and can handle up to 4500-PSI. Just say the word and we’ll connect you with our helpful pivot coupler. Like the wands above, our longer hoses allow you to cover more distance. 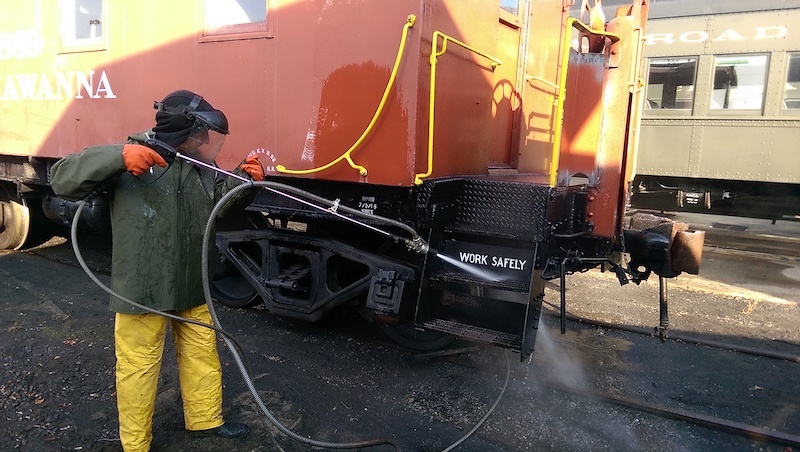 If you need to be more mobile while cleaning, we’ve got you covered. 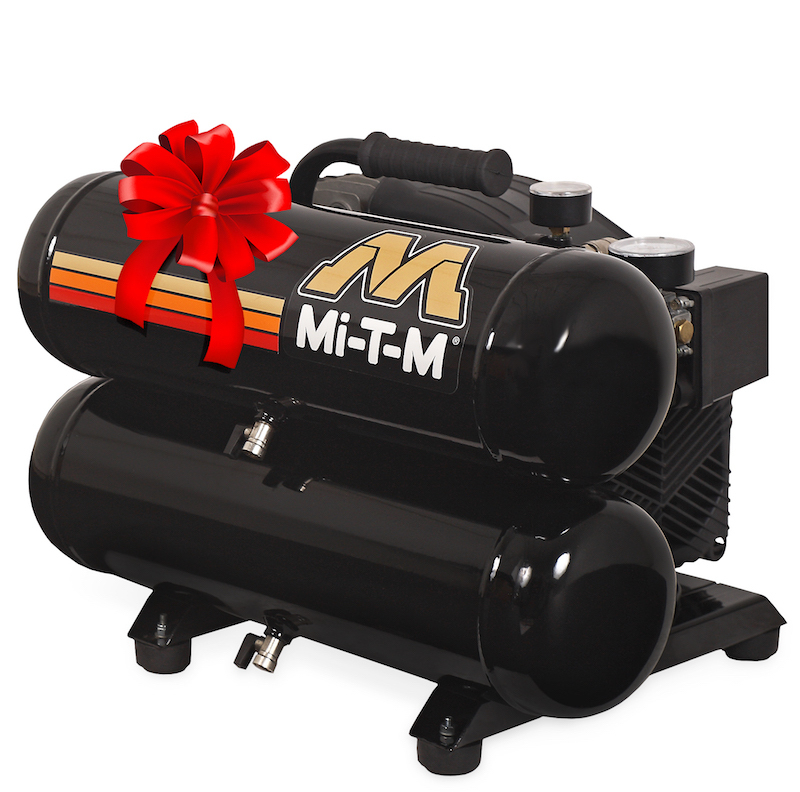 From 50, 75, 100, 150, and 200-foot lengths, our Mi-T-M hoses are designed to handle a wide variety of PSI requirements and temperatures. Our cold-water hoses are resistant to chemicals and our hot water extension hoses come assembled with screw and quick connects. All our high-quality extension hoses can withstand temperatures up to 250 degrees. We know everyone’s cleaning needs are different; we have an extension hose for you. Water alone is great. But pair it with the right cleaner and you’re really off to the races. Trust our large line of Mi-T-M detergents. Our environmentally friendly blends can be used indoors and outdoors. Available in 1, 5, and 55-gallon sizes, our cleaners also prevent spotting. Choose from our all-purpose cleaner, deck and house wash, or heavy-duty degreaser. Tell us your cleaning needs and we’ll help you select the perfect detergent to accomplish your goals. You can also request a catalog for more information. Wouldn’t it be easy and efficient to stand on the ground and clean your gutters? Now you can. Using our special gutter cleaning attachment, you’ll have up to 4000-PSI of pressure at your fingertips. With a flip of a switch, you can blast away leaves, dirt, branches, and anything that is clogging your gutters. Don’t risk your neck by climbing on a ladder of the roof. Plant your feet on terra firma and say sayonara to dirty gutters. If you’ve ever spent time trying to untangle a cord or hose, we’ve got the perfect product for you. Many of our hose reels feature convenient 360 degree pivoting action for ease of use. 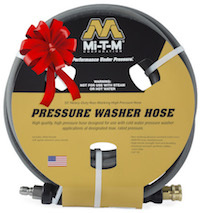 The reel capacity of each model depends on the type of Mi-T-M hose you use. You’ll appreciate the easy mount bracket design of our many types of hose reels. Our authorized dealers will help you select all the accessories you’ll need, including brackets, elbows, reducers, and jumper hoses. 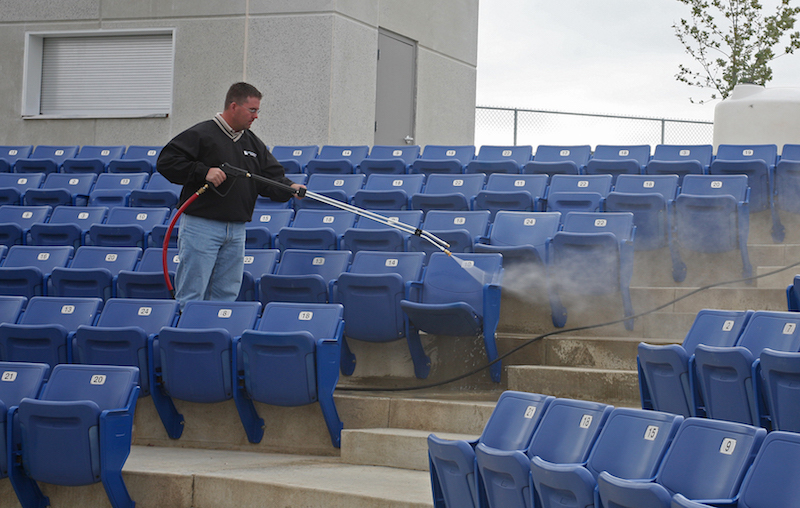 Our specialized Mi-T-M liquid treatment is just the ticket for maintaining your pressure washing equipment. Just as heart valves sometimes need stents and plumbing pipes needs snaking, our pump saver is designed to flush out harmful built-up materials, including mineral deposits. Perfect for all pressure washer models, our pump saver solution preserves seals and pistons. When you’re ready to store your equipment for winter, pump saver protects against freezing temperatures. With a variety of sizes ranging from 14″ to 28” in diameter, this powerful cleaning accessory is aces for cleaning large surface areas. 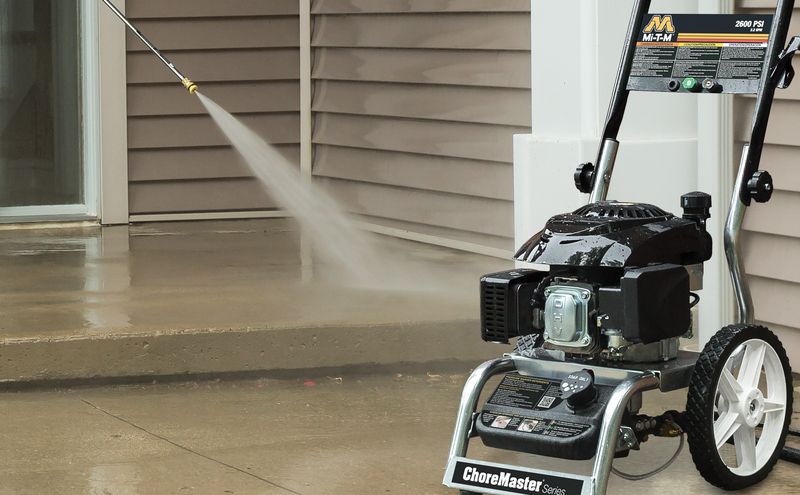 If you’ve ever used a regular pressure washer for large spaces, you know it takes patience and a slow certain sweeping rhythm. If you miss a spot, it shows. You don’t have time for that. Use our rotary surface cleaner for driveways, decks, sidewalks, patios, and other areas. Here’s how it works: Put your hands on the lightweight frame to guide it as it glides along the surface. The tough bristled brushes rotate and go over and over the surface. Large wheels make it easy to operate and you’ll simply love the results. Using this amazing tool, you may find yourself singing Snap’s “I’ve Got The Power” song. Why? 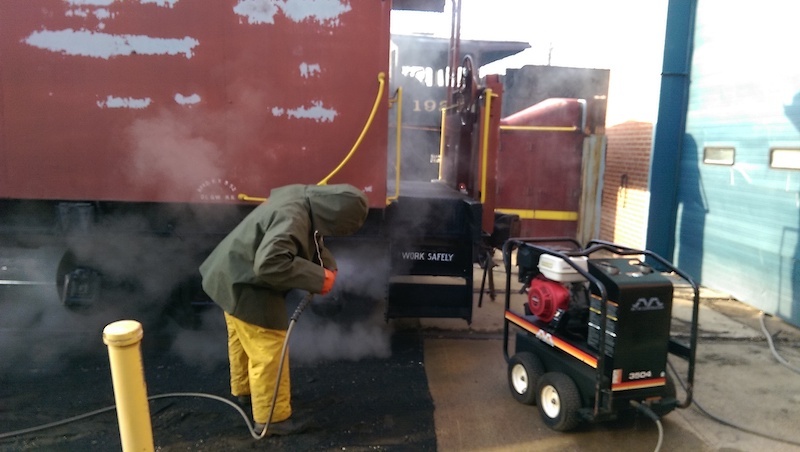 Our Mi-T-M sand injector can strip away coatings from concrete and steel. Got graffiti? No problem. Use the sand injector to blast it away. Rusty surfaces? Stripping paint? Random stains? The sand injector accessory is the answer. Imagine how long it would take by hand for the same result. Once you try our sand injector, you’ll be hooked. If variety is the spice of life, you’re going to love our shut-off ball valve accessory. 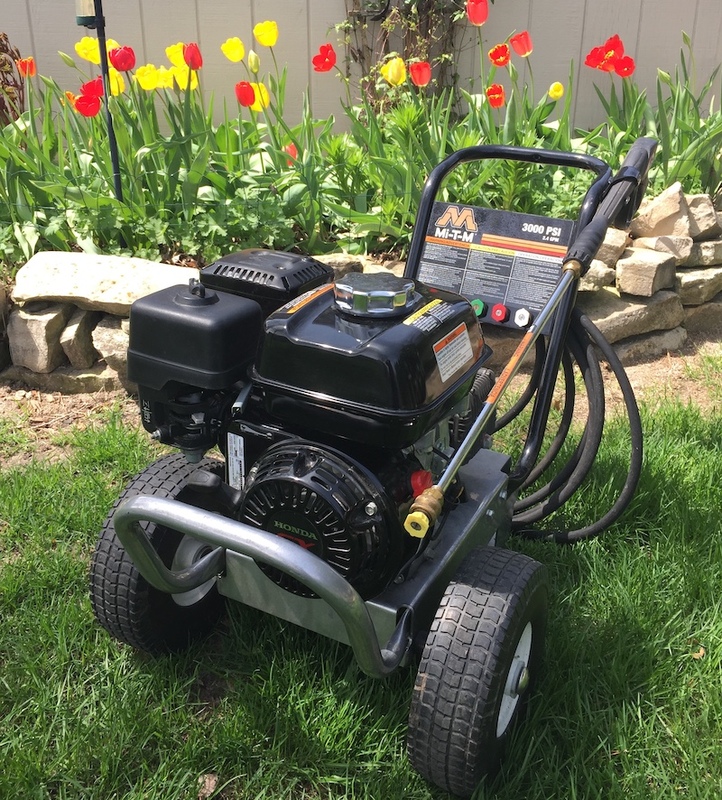 Attach this quick connect outlet and you’ll be able to easily and conveniently switch between a pressure washer gun and a rotary surface cleaner. Imagine you’ve just covered a patch of concrete and a single stain remains. There’s no need to go back over the entire surface area again. Switch to the gun and you can quickly get rid of it. 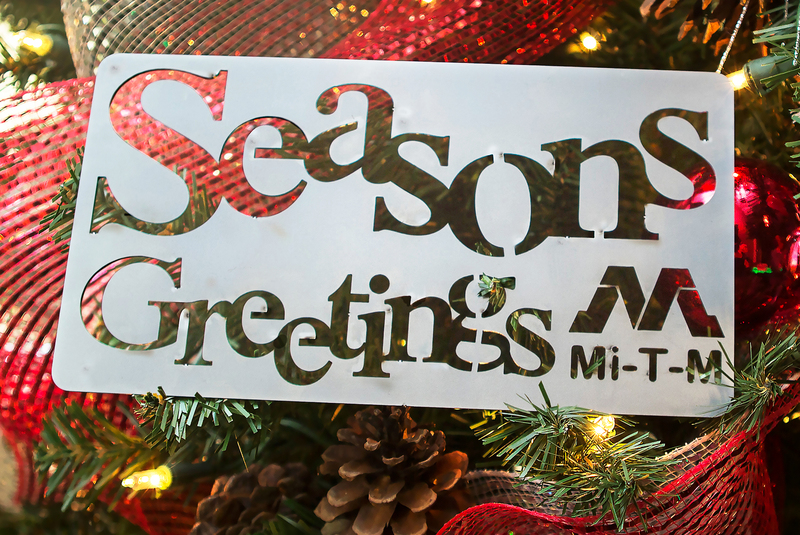 We hope you’ve enjoyed learning more about the many accessories we offer at Mi-T-M. 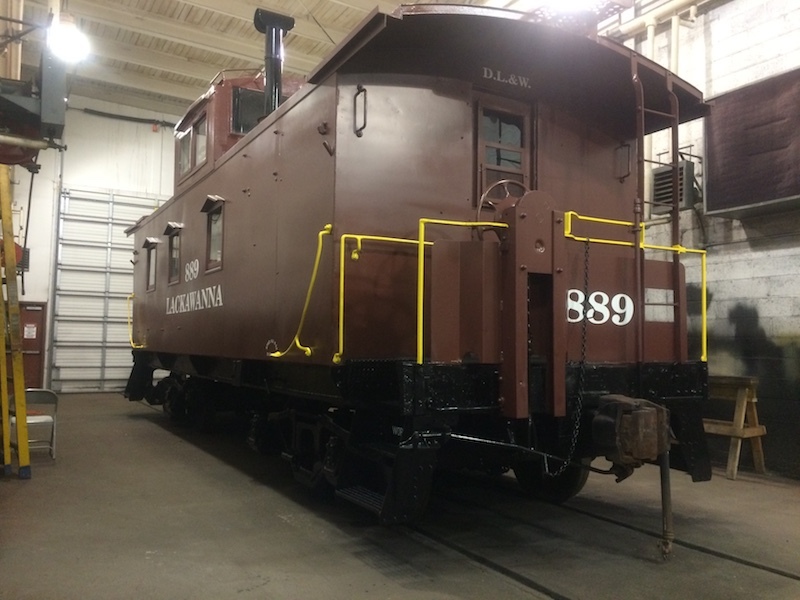 Since 1971, our goal has been to provide the most powerful and most innovative cleaning equipment on the market. 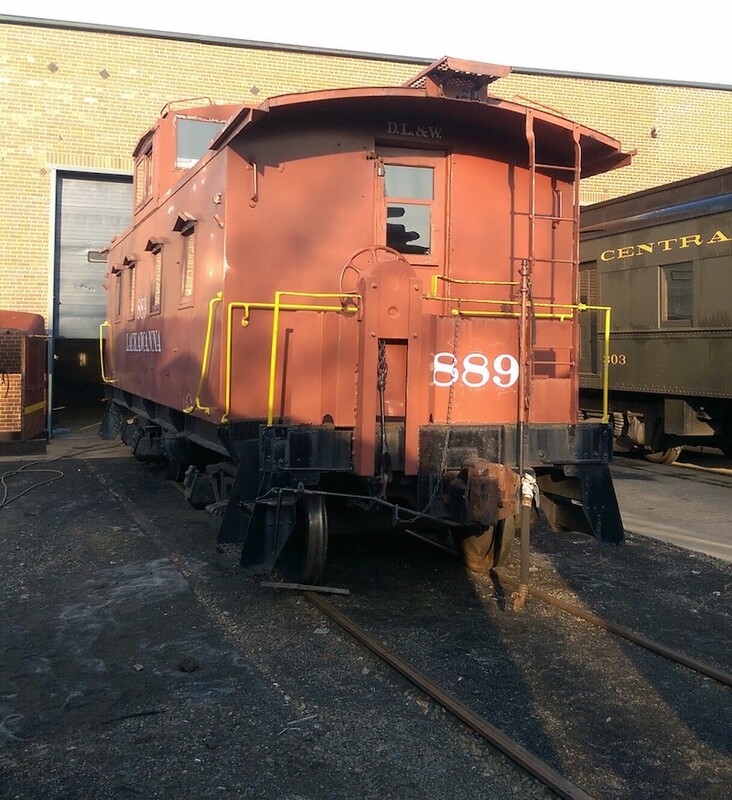 Our accessories, like our equipment, are designed and made by leading industry engineers. 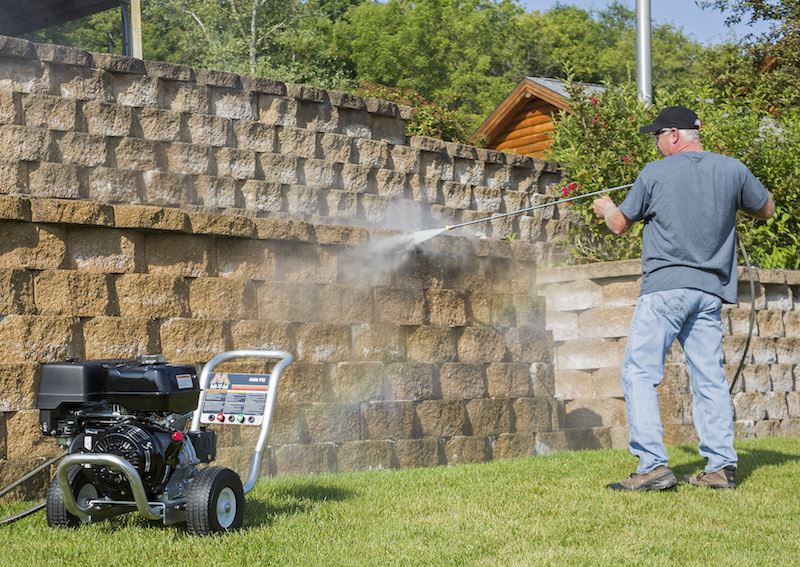 Trust Mi-T-M for all your pressure washer needs.